If you ever visit a San Diego farmers' markets, then chances are you'll see several people milling around who are holding tall, clear plastic cups filled with deliciously ripe fresh fruit such as mangoes, pineapple, and watermelon that have been doused with lime juice, salt, and chili pepper. They may be eating the fruit with a long toothpick (or just with their hands, if they don't mind sticky fingers). These fruit cups, called copas de frutas in Spanish, are the inspiration for today's recipe: salty, sweet, and tangy Chili Lime Fruit Salad. I have incorporated seasonal fruit such as fresh strawberries, blood oranges, and kumquats, but feel free to substitute what's available where you live. I added jicama (pronounced hee-kah-mah), also known as a Mexican potato or turnip. 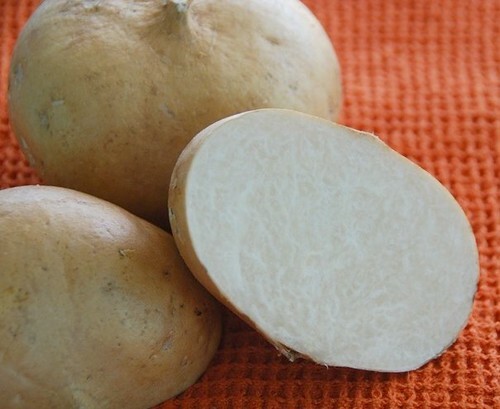 It's a large, dense root vegetable with a thin beige peel and a juicy, creamy white flesh. What does jicama taste like? Jicama tastes sort of like a cross between an apple, a potato, and celery. It's mildly sweet and exceptionally crunchy, like a water chestnut. For your Mother's Day breakfast, serve the fruit salad in individual bowls or glasses, or if it's easier, in one large dish, family-style. It'll be delicious no matter how it's served. This salad is highly versatile. Feel free to substitute any fresh fruits you prefer or that are in season where you live. Navel oranges, pineapple, watermelon, cantaloupe, and kiwi are delicious alternatives. For the fullest flavor, serve fruit at room temperature. Place the fruit in a large bowl, and gently toss. 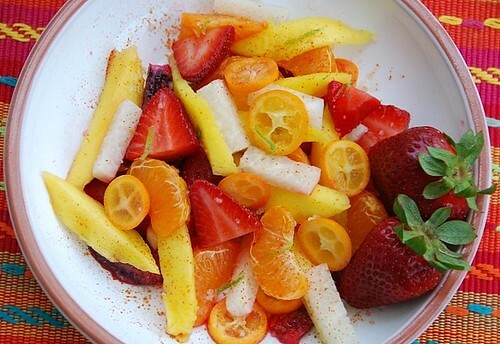 Start by sprinkling the fruit with the juice of 1 lime, and season with cayenne pepper and sea salt. Taste it. Then adjust seasonings accordingly. Place in a serving bowl or dish, and garnish with lime zest curls. Serve at room temperature. Alternative garnishes: unsweetened shredded coconut and fresh chopped cilantro or mint. Have you gotten this week's earlier Mother's Day breakfast recipes? Actually, I'd like to be sent to a San Diego farmer's market for Mother's Day. I love reading your blog even though I know half the fruits and vegetables will never show up where I live. Yes... nerds candies, and the pairing was great with the lime! And I want to make a salad like yours for my mother-in-law on Mother's Day! We're going to their farm in the countryside... the chili addition is awesome. Beautiful salad, I would love my sons to make this on Mother's Day. what a lovely fruit salad.. now I've to admit, i haven't had kumquats before.. do they taste like key limes? also, the addition of cayenne pepper really made me curious.. hmnn..
Love the collection of Mother's day ideas. Will keep this recipe in mind -- my mom loves jicama. I recently discovered the joys of kumquats this past year and have taken to adding them to just about everything. Right now I've been adding them to a mixed green salad. I think they add so much color and flavor to dishes. 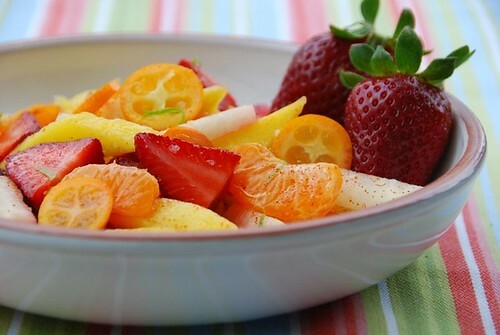 This fruit salad looks wonderful- makes me want to go have picnic! Love Jicamas!! Fortunately we get plenty here. & spicy, tangy & Sweet! Perfect. Oooh now that's easy and lovely. Too bad I can't ship it to my mom in New Jersey. Such a nice treat for Mother's Day...never had chili on fruit salad...sounds terrific and the colors are just beautiful. By the way, thank you so much for visiting my site and leaving nice note. I really appreciate. Just delicious... and a beautiful dish, too! I love the idea of chile with fruit. Today at the farmers market I bought kumquats, and I was wondering what to do with them. Now I know! Stunning combination of fruits. And the lime is the perfect accompaniment. jicama is such a refreshing thing, this salad looks delicious! I love this! What a healthy way to indulge the sweet/salty/tangy craving. And I have most of these fruits waiting for a "plain" fruit salad. Consider them repurposed. goody-That would be a fabulous way to spend Mother's Day! Thanks for the kinds words. cris-A farm in the countryside sounds idyllic. jescel-They are super tart but sweeter than a lime. I have written about them here as well as on the NPR site, if you'd like to learn more. (See link on right side bar). stephanie-I love them in green salads as well. They add sass! lynda-The heat contrasts so deliciously with the sweet fruit. kiwi-I think so too. I love to snack on it. We hope to spend summer out your way- even if we haven't yet sold the house. I so look forward to the farmer's markets. This salad? It looks like jewels on a plate. Love this! Would have never thought to use jicama in a fruit salad but I am definitely going to do that next time. My eye was initially attracted to the extraordinary colors in the photograph...and then I read the ingredients. Jicama is an underused vegetable. This sounds so...satisfying.